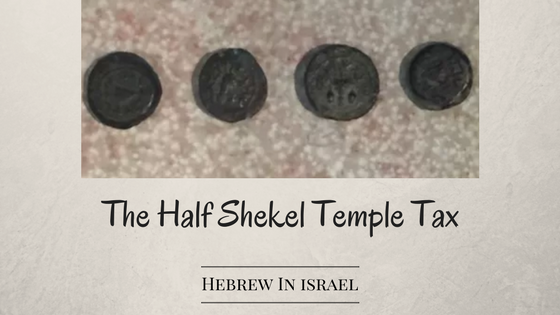 During the second temple period a custom developed to give a half shekel to the temple. The act is known as “The half shekel temple tax”. Little do people know that this tax was not agreed upon by all.We first must note that an objection to the Half Shekel tax can be found in the comments of the Sadducees found in Talmudic sources. The Sadducees rejected this teaching and claimed that no such tax appears in the Torah. However it is important to know that the Sadducees claimed that all temple functions must come from the priests (Regev, 2005, 132-139) Hence their rejection is not necessarily based on the interpretation of the section in discussion. When reading this text in full, one can see the following words: “When you take a census”! This means that only when you take a census you are to take half a shekel, not every year. Moreover, the half shekel was created to atone for the people when they are counted, as verse 15 says “to make atonement for your lives”. An example for the need of the half shekel can be found in 2 Samuel chapter 24 where we have the story about King David wanting to count the people and as a result of that action a plague is sent by God. “…then each man is to pay a ransom for his life to YHWH when you number them, so that there will be no plague among them when you number them”. The Torah treats the counting of the people as a dangerous act that can bring death and destruction on the people. It is possible that it was a government tax that in time was confused with a Torah law, and the original function was forgotten. Another possibility, and a more likely one, is that it was a freewill offering that was instated in the beginning of the second temple. “And we accept upon ourselves commandments to give one third of a shekel each year for the work of the temple of our God” Nehemiah 10:33 (32). If you look in your English bible you will see differences between what I have written here and the translation one might have. What the Hebrew says is that they created commandments (Manmade Mitsvot) to give a third of a shekel to the temple. When the rabbinic sources talk about the half shekel and what it is used for, there is an astonishing resemblance in function between the two. “When Israel came from the Diaspora they used Darkonot and then Selaim and then Tevain and they wanted to use Dinarim” (Shekalim 2:4). If we read between the lines we can see that the half shekel and the third of the shekel are the same thing. Both started at the same time, both were used to uphold the temple, and we do not find a third of a shekel in the later stages of the second temple, only the half shekel. No one can argue that in time they stopped using the third of the shekel because the economy got better; but if the Torah commanded to give half a shekel what is the need for the third of a shekel? Why impose another tax if the Torah anyhow has one, and especially when the economy is so bad? Wasn’t the point of giving the third of the shekel because the economy was bad? Why have two taxes? If funds are needed, use the half shekel, don’t create a new tax. This goes to show that they needed the third of a shekel because there was no half shekel tax. And here is another important point: There is also the opinion of some rabbinic sources that the third of the shekel was the exact half of the main coin used in the Persian period, and every time the coin changed they kept it as half of that coin, regardless of the Torah weight (Rambam). This comment by Rabbi Yehuda explains why it was called “half shekel”. When it was started it was a third of a Torah shekel, but in time the main point was to give half of the common coin of the time. This might also explain the differences in weights found between shekel weights and coins. Each time it was half of what was used by the main government. And one last point. We also need to remember that the people who returned to Zion were interested in atoning for the sins of the people, and by adding a gift to the temple in the form of a half shekel, which resembled a form of atoning in the Torah, they were actually atoning for their sins (not to mention the need to atone for the census). With all the above I conclude that the half shekel temple tax and the third of a shekel are one and the same, and that there is no Torah commandment to give a half shekel to the temple. There is only a commandment to give a half shekel when taking a census, but any money given to the temple comes from the sacrifices and Torah fines or from freewill offerings.